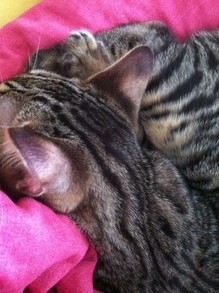 A Toyger should have headlights and modified tigery stripes, distinctly different from the ordinary domestic mackerel pattern. 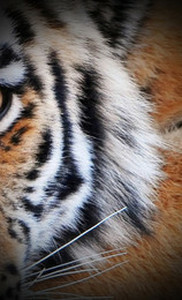 The more tiger traits the better. In our Toygers we are looking for traits such as braided stripes, circular face markings, whited expressions, high contrast, ocelli and no dorsal stripe. The most important desirable traits will be listed below. The simplest version of the striped pattern are the so-called Zoned Stripes. The stripes are divided into 3 zones, upper zone, middle zone and lower zone. 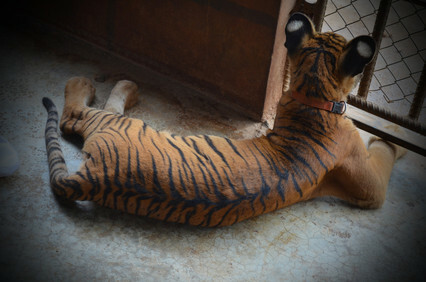 The stripes can be solid black to brown, or two-toned with so-called 'outlining' and always with as much contrast to the background color as possible. Stretched Rosettes are like the Zoned Stripes divided into 3 zones, only that they open up into a stretched rosette in the center of the stripes. 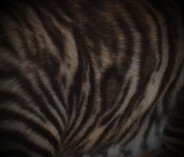 This pattern can be seen in many tigers.These stretched rosettes can either be filled with a second color, or have the same color as the background color. 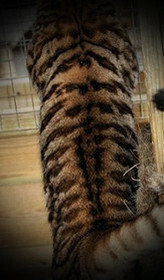 In my opinion, the so-called Braided Stripes form the most exciting and tigery patterns in our Toygers. In this pattern the two preceding variants come together and the stripes can be thick and thin, be simple stripes and stretched rosettes, have very fine dotted stripes, ect. The stripes can and should be interwined in this variant. Here, too, the basic division into 3 zones still applies. Over the back striping is very difficult to breed and very rare. 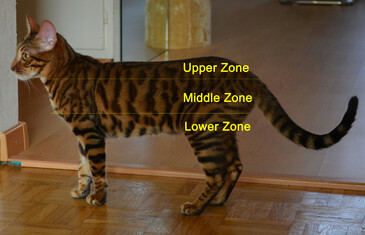 OTB occurs in no other domestic cat breed and even in Toygers this is very rare up to now. For me this is one of the most desirable Tiger traits which we want for our Toygers in the future. 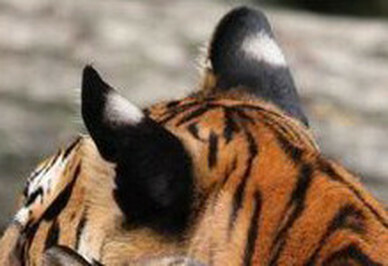 Ocelli are the white spots on the back of the ears of wild cats. These spots will never be white in Toygers and Bengals, but a brighter spot, surrounded by darker hair is desirable, though not every cat has it. One of the desired features on the head are circular markings on the cheeks of the cat. 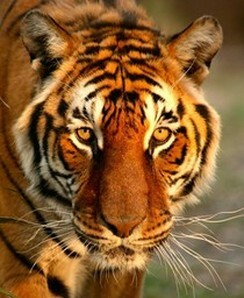 Those markings form broken up circles around the face together with the chevrons on the forehead of a tiger. First successes have already been achieved. Chevrons are the - in opposition to all domestic cats - horizontal markings on a tiger's forehead. These are very difficult to breed and so far there have only been some succesful approaches to this feature. 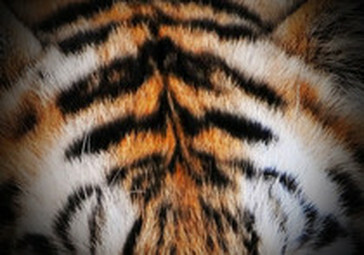 The so-called Headlights are the tigers white markings around the eyes. 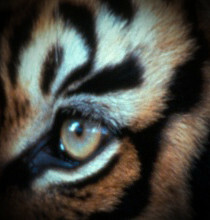 The aim of our Toygern is to have as bright as possible and high markings around the eyes.